Local organization Seeds of Grace is planting roots in Bremerton’s Lulu D. Haddon Park, and will provide organic produce to the community’s primary food bank, Bremerton Foodline. Seeds of Grace volunteers rally together with great camaraderie to achieve one common goal: to teach and provide agricultural sustainability in a global capacity. Since March 2014, Seeds of Grace has played a dynamic role in introducing sustainable gardens to impoverished areas, like Mazatlan, Mexico. Now, the focus has shifted back home. 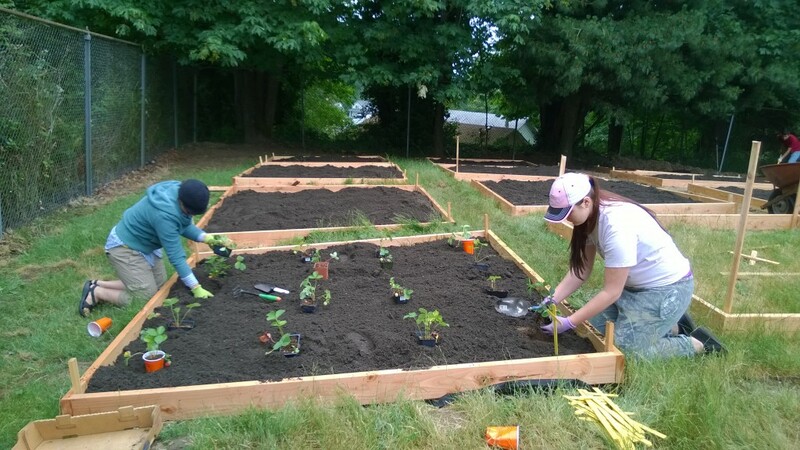 Karole Johnson, Team Lead of Seeds of Grace and Bremerton native, secured support from over 30 volunteers and donors, who provided manpower, in-kind donations and monetary backing for the “Lulu D. Haddon Park Garden Project,” which was completed on June 14, 2014. The garden is nestled in a secured area of the park, where its strawberries, kale, hot peppers, tomatoes, carrots, onions, salad greens, beets and other offerings can flourish to their full potential. Once harvested, the fruits and vegetables will be donated to Bremerton Foodline to be served at the tables of those who are in need across the community. The spring harvest is expected to begin in July, and will make room for winter crops, like squash and Brussels sprouts. Johnson anticipates that more than 600 pounds of food will be donated over the first year of the partnership. Unlike typical community gardens, the crops do not get divided by plots among community members. Instead, all of the food that is harvested is done so by volunteers who choose to serve their neighbors, then the food is given to a place that feeds the hungry. Seeds of Grace is now setting its sights on future projects, such as building additional gardens within other Bremerton parks, introducing a curriculum into schools to teach children the importance of sustainability and its return trip to Mazatlan in the fall. “When your motivation is to help others and to love others, just do it. People are going to be inspired by that,” says Johnson. It costs between $500 and $1,200 to build a sustainable garden locally, and international gardens start $12,000. If you would like to participate in an upcoming Seeds of Grace project, you can find a list of opportunities online at www.dreambigaskbold.com, or you may email at info@dreambigaskbold.org. There will be a ribbon cutting ceremony at the Lulu D. Haddon Park garden with Mayor Patty Lent in attendance, at 3:30 p.m. July 24. This is a wonderful project! My wife and I support the mission of the Bremerton Foodline and are delighted to know that more whole, fresh foods will be available to those who could otherwise not afford it. We applaud the Seeds of Grace initiative! We are also aware of support from local service clubs, particularly the Bremerton Central Lions Club, who volunteered to make this dream a reality! Thanks to everyone involved! I am so grateful for the publicity this article has brought to Seeds of Grace. The people who donated to the first Bremerton garden were numerous, but I will try to list them all… Viking Fence blessed the garden with the chain link fence. H.D. Fowler blessed us with the plumbing fixtures. Sign Town was gracious and blessed us with the acknowledgement sign. Starbucks of Kitsap Way blessed us with a Cambro of coffee. The Boat Shed contributed to our lunch with their amazing signature Caesar salad. Island Cuisine on Washington Avenue set us up with delicious Lumpia and Pancit. There were several individuals who contributed cash and material donations. And the partnerships that are being built in our community remind me of when I was just a kid growing up here! Neighbors coming together for a common cause… Loving others. I love my city! I am so excited that Seeds of Grace has the opportunity to serve the people of our beautiful city!